Some notes, so I can put some awesome bullet points in this thing. That's 66 photos of sandwiches. There's one picture that is just a slice of pizza. That was my mistake, and I am so, so sorry. I decided to include burritos. They are kind of like a sandwich, bread type stuff on the outside, food in the middle. I decided to leave out tacos. I don't know why I would include burritos and not tacos, but I DID! SO DEAL WITH IT! That has 130 different photos. In conclusion, I probably take too many pictures of food, and sandwiches are yummy. I was writing a post about the Needham Times, which I should say I like a lot, again, and I really appreciate how it arrives magically in my driveway every Thursday. That post got way too long. In that post, I started writing about the Top Ten Stories of 2012 in Needham. I decided to make a separate post about it. So, here's the top 10 stories of 2012 per the Needham Times, followed by my comments in italics and then my list of top stories follows. I'm sorry if you read all of that, it was a waste of your time, I should have just got right to the list. 1. Aly Raisman becomes Needham's Princess at the Olympics. Also, Needham native Sunita Williams goes to space (again! ), commands the International Space Station, and sets records for the most number of spacewalks and total time spent on spacewalks. I also happened to be in Needham Center when Aly returned to Needham. It involved helicopters, many policemen and lots of flags. Then later we went to the Rally for Aly which was fun. So, I'd put Aly #1 and Sunita #2. Yeah, commanding giant spaceships only ranks #2 on my list. 2. New senior center breaks ground. This one doesn't interest me at all. 3. Focus on fresh food. This one is really vague. I guess there's a farm stand and other places now sell healthy things. Umh, that's way too high on the list. I would put a loose bear higher than some healthier cookies. Yes, there's a bear coming up. There's a field in Needham called Cricket Field. It is set up so you could play cricket on it. Cricket is a sport. They might tear the field down for a new school. Did you know Needham was at one point considered the Cricket Capital of New England. Also, did you know I was the Cricket Club President in high school? So I am firmly in the Save Cricket Field camp. This one is on my list, but a loose bear and a new convenience store are higher, as they should be. 5. N-STAR tree cutting plan. I can't get interested in this one at all, it's off my list. Sorry trees. 6. Election 2012. Needham voted to allow alcohol sales. If I want a six pack of beer, it will soon take me 5 minutes, instead of now I have to go to Newton which takes about 30 minutes roundtrip. This is #3 on my list, just behind a Needham astronaut flying around in space. Space! Like not on Earth. I went there the day it opened and learned Double Gulps are $1.70 at this new location. Also, the new location doesn't have Diet Mountain Dew or sugar free Slurpees on tap. Fix, yo' stuff 7-11. 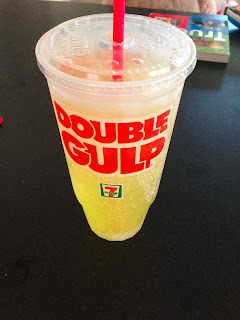 Good thing the other Needham 7-11 has both of those things, and Double Gulps cost $1.50 there. Yes, I was very excited about a 7-11 opening, even though there was already one in Needham. We got really lucky during Hurricane Sandy. We never lost power, no water came in anywhere, and just a few branches came down, and we had a good time watching TV that night. It was a crazy storm to witness, but it would be pretty low on my personal list. Although, I think it should be higher on Needham's list. The Times has fresh food and possible tree cuttings ranked higher for some reason. 9. Olin College celebrates 10 years. I have no snarky remarks about this one, it might make my list I guess. They have a loose bear at #10, eight spots behind senior center news. A bear was running around Needham, but more importantly you can now buy healthier cookies somewhere. 1. Aly Raisman becomes my favorite gymnast. Yes, now I have a favorite gymnast. 2. Sunita Williams commands a space station. In space! 3. Needham enters the 20th century and allows beer to be sold to adults. 6. Cricket Field thingie. I was a terrible Cricket Club President I should mention. 7. Blue Ribbon opens a food truck in Needham. I like BBQ. Also a Subway opened, I'll just combine those two here, since it seems random combinations are fine in this list. 8. Hurricane Sandy. This ended up at the same ranking as the Times. My apologies. 9. Olin College. Heather and I heard they had good cafeteria food so we ate there once. It was pretty good, so it's number 9. 10. A Needham resident eats a Filet-o-Fish for the first time and decides to start a stupid blog. That's me! In my last few posts, I have started by apologizing for not blogging more often. At this point, I'm not even sure there is anyone reading this blog, but again, I'm sorry. I think the problem is I have a few draft blogs saved, and I don't like any of the topics. So when I think: "Hey, Jeff, let's go blog! ", I go through the drafts and get discouraged. One draft is about sneakers. Do you really want to read about sneakers, imaginary blog reader? When I got it, it was in a plastic bag with some snow on it. I could only see the giant headline. I read it and thought, "WHAT RESPONSE ARE WE WAITING FOR!?!" I wiped away the snow and frantically read the rest of the story. Summary: Needham, the Town, is waiting for a response from NSTAR, the company, about the tree management plan. That's what the top story, in near "VICTORY IN EUROPE" type, was about. 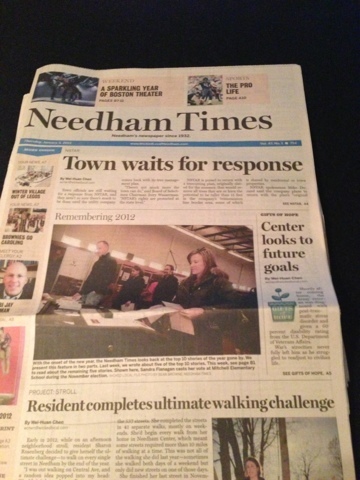 The Town of Needham is awaiting tree maintenance plans, and the headline teased that. Yup, big news. Here's the next headline: "Center looks to future goals." I think any Center in Needham is looking to future goals. Needham has lots of Centers. So, good luck whichever Center. My first thought was: "ANOTHER BEAR!?!" My next thought was: "I VOTE NO BEARS!" Then I locked all the doors and shut off all the lights and got some bear repellent. By the way, bear repellent is a great way to ward off human attackers, much better than mace. I learned that by watching Doomsday Preppers. I wish I would stop learning things from Doomsday Preppers. I read more of the article about bears voting to figure out the headline, and it is the second part of a list of top Needham stories of 2012. The bear and the voters in the headline refer to different stories. It was the same bear from before. I still support the "No Bears" political platform. That leads to the final headline from the front page: "Remembering 2012." I remember 2012! The front page has a picture of people voting. I voted in 2012! I remember that! The story is the second part of the top stories of Needham 2012, which is a year that I remember! Here's a link for part 1. A Double Gulp is a massive amount of soda that costs you $1.50. Before the new 7-11 opened Heather was jogging by it, and knowing my interest, when she saw some workers she asked when it was opening (I <3 U Heather) [Heather, that's a heart]. They told her the date of the opening. 7-11 is named that because all stores are open from at least 7am to 11pm. So 7:20am on the day it was supposed to open, I sprung out of bed, sprinted to 7-11, and was heartbroken to learn it wasn't open yet. It opened up later that day, like a soft opening, and I was probably the 27th person to buy a Double Gulp later that day. Sad end to the story, huh? Update: At this point in this post, I started analyzing the Needham Times' top story list, and came up with my own list. This post here is already way longer than I ever expected it to be, so I decided to make the other post a separate one. I will add a link here later, if I remember (I won't remember). LINK RIGHT HERE, LOSERS!